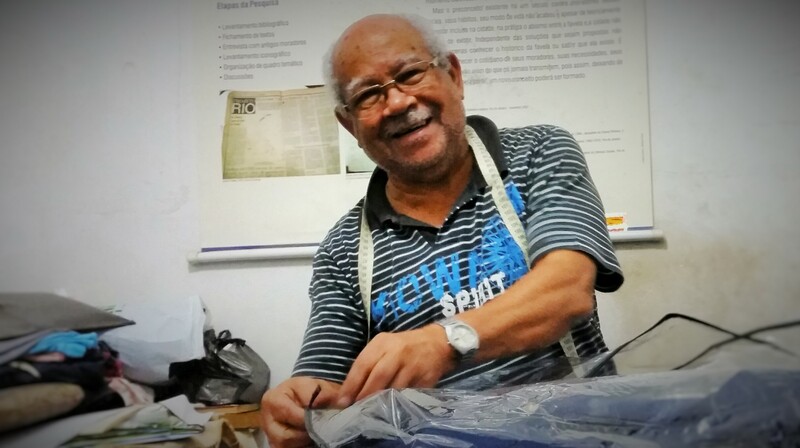 This is my story: I was born on October 9, 1930 in a small place called Santo Antônio dos Pretos, in the municipality of Codó, state of Maranhão. Where I’m from there’s no running water, no electricity, no schools, no roads, still today there isn’t any of that. The people there in the morning would go into the woods to break five, six kilos of coconut, arrive back at night, buy half a kilo of rice and go eat. On the days that you didn’t break any coconuts you had nothing to eat. My father never broke coconuts to sell; we all worked on his little farm harvesting rice. He put the rice on the two or three animals he had and traveled about 60 kilometers to sell it; he would buy a pack of soap, a bag of salt, a bit of clothing, and go home to prepare the next harvest. That was our life. My mother had twelve children but some of them died – there weren’t enough resources, we didn’t have anything, no one knew that one was diabetic. Of the twelve that she had, five survived and I was the youngest. When I was eight years old my father let me spend Christmas at the house of my future brother-in-law. For the first time I saw a truck, a tiled house – from a fallen house covered with coconut mud to this beautiful house with running water, caramba! It wasn’t a large city, but for me it was really something. The next year, in 1939, my sister married him, and she asked my father to let me live there since she was on her own, with only his family. In 1941, my brother-in-law moved with her to the interior. I didn’t want to go with them, so he arranged an apprenticeship with someone who was a tailor; I lived in his house and learned the profession from 1941 to 1948. I started school for the first time, but I never got my diploma. At the end of the year the school held a parade to mark its closing, but I didn’t participate because I didn’t have shoes. I went to the plaza and stayed there barefoot, my classsmates parading and me on the side. My father lived elsewhere and didn’t have the money, and while I was living in this other man’s house he wasn’t going to buy them for me; I wasn’t raised for him, he wasn’t going to spend money on me in that way. So I never got my diploma. 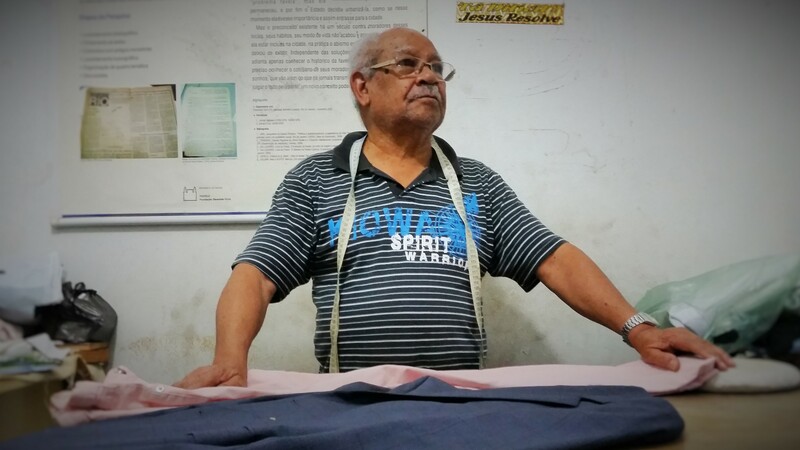 In January of 1948 I told the tailor that I was leaving, because I already had two brothers who lived in the state’s capital, São Luis – a big city, I thought, there it’ll be all different. I had written a letter to my brother that I was going, but when I arrived at night on the train – in that time they had those trains with smoke coming out – no one was there. Someone passed by who was from my city and who had already moved there, and he saw me and told me that he had a room to rent. I was really scared when I passed by the station guard because they said that in the city if you didn’t have your documents you’d go to jail [laughs], so I ran when I passed by, the guard didn’t even see me. I went to that man’s house to stay in that room, and the next day he found the address of my brother and brought me there. I lived in São Luis for six years, from 1948 to 1954. 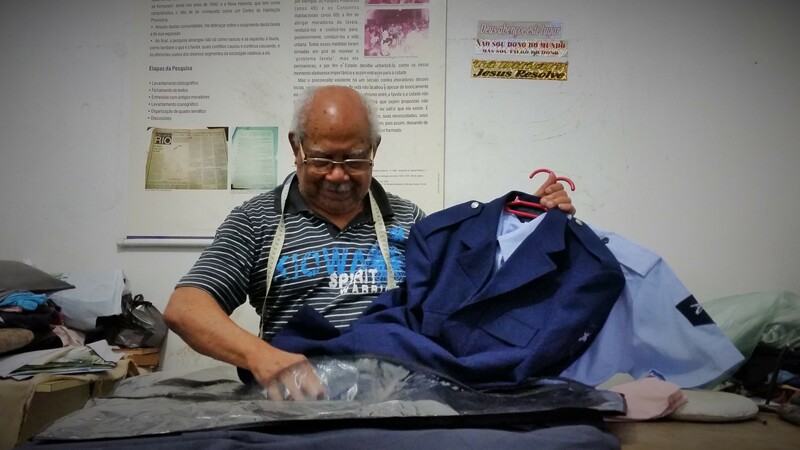 I ended up working in my profession as a tailor, and I matriculated for school at night. That’s where I got my diploma for primary school. I thought about that for a while, should I go or not go, go or not go. People told me, “Rio de Janeiro is nice, your life is going to get better living there, you’ll be able to work.” And I kept thinking: should I go, should I not go. Then I decided: I’m going, if it doesn’t work out I’ll come back. On November 29, 1954, I arrived here in Rio de Janeiro. And thanks to God that machine was the beginning of my work. I tore down that wooden shack and made a larger house, then I sold that house and bought a shack here, in Morro do Timbau. Here it was bad too, but I bought the shack, made this house here, and today thanks to God it’s all mine. I opened an own office downtown and worked there from 1962 to 1974. I had a good clientele but I didn’t want to keep paying rent, paying taxes, paying all these other things, and after I finished this house here I had a room that was sufficient for my work. So I closed the office downtown and I’ve been working here through today. It was in 1979 that Project Rio** came here, and after that the minister managed to get the state government to give us property titles, and so with my property I pay my taxes. From that point on I stopped being a favelado**** and became the owner of that which I most longed for, to have my own house. When I arrived here there wasn’t anything. We all lived here, all the residents, but no one had any documents. Thanks to God we fought and we fought and we managed to ensure our stability. Today it’s mine and nobody can touch it. That’s my life, that’s my story, it’s life always giving it my all, always working. I never did see my father again, he died after I married in 1960. He really was saying goodbye back then, when he told me, “you go, you’re not going to see me again but you should go.” My mother came here once to visit, but she had bad luck, on the day she was supposed to return, she was hit by a car on Avenida Brasil. She broke her leg in two places, went to the hospital, remained six months recuperating, but she went back. She died ten years later. Me and my wife live here on the first floor and above is my daughter and a couple who pays rent. I have three grandchildren, two boys and a girl. Me, the future? My future is to wait for the days to pass until God calls me and for me to go to Cajú. **** I turned 85 in October. What more am I going to do? * A state in Brazil’s northeast, sometimes referred to as the African capital of Brazil for its role in the slave trade and its large black population. I am so glad to ‘meet’ this happy and wise tailor whose story, albeit far away geographically and culturally, reminds us that family and love matter most. He is poor, but rich. I was so happy when your Favela story popped up! I couldn’t read fast enough – such an interesting account of survival, courage, and determination. I was especially touched by the comment made by Atanasio’s dad’s, “This life is yours.” That really says it all. A full view of a meaningful life filled yet not overripe with hardship and struggle. In an admirably ordinary sense, Atanasio is the very definition of stoicism. What an interesting story of faith, love and determination. This is the first posting I’ve receieved. You’re a good story-teller-or is it a story-extruder?, Sasha.